5 - 4..........Jago von Beelen. 2002: 90-93-94 = 277 points (4th). 2001: 96-91-93 = 280 points (4th). 2002: 93-89-97 = 279 points (6th). 2001: 100-95-91 = 286 points (1st). 2000: 94-90-98 = 282 points (4th). 1999: 100-97-97 = 294 points (1st). 1999: 97-98-96 = 289 points (8th). 2002: 97-91-87 = 275 points (15th). 2000: 98-88-88 = 274 points (17th). 1999: 94-98-98 = 290 points (1st). Baron vom Lechfeld passed the Körung 'for life' with Körklasse 2A rating and lived to almost 7 years of age (died from bloat). He was a two time winner of the D.V. Meisterschaft and working IDC Vice-Weltmeister, as well as participating in several DV and DVG Landes Meisterschafts. 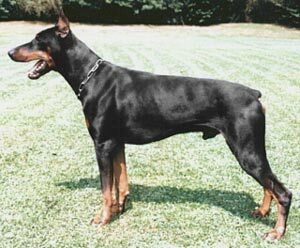 Baron is sire of two time working IDC-Weltmeister Mona vom Edertal and D.V. Meisterschaft winner Hajo vom Aurachgrund.